The Whitney Museum of American Art started out in Gertrude Vanderbilt Whitney's studio on Macdougal Place in Greenwich Village and moved into a very handsome new building at 8-12 West Eighth Street designed by Miller & Noel in 1931. According to a February 17, 2005 article in The New York Sun by Francis Morronne, Augustus Noel was Whitney's son-in-law. In 1954, eight years after Gertrude Vanderbilt Whitney died, the museum moved to 22 West 54th Street into a building also designed by Miller & Noel. It faced on the sculpture garden of the Museum of Modern Art and was on land owned by MoMA. According to Mr. Morrone, "to ensure architectural harmony between the Whitney and MoMa, Philip Johnson consulted with Miller & Noel on the Whitney's design [which]...also coincided with Johnson's radical redesign of MoMA's Sculpture Garden....In 1963 the Whitney, under director Lloyd Goodrich, announced its intention to move to Madison Avenue and 75th Street. The museum felt its space on 54th Street to be inadequate, and disliked being overshadowed by MoMA. The Whitney hired Marcel Breuer to design its new building. (The museum had considered, then rejected, Louis I. Kahn.)" The Brutalist building designed by Marcel Breuer on the southeast corner of Madison Avenue and 75th Street is, along with Frank Lloyd Wright's inverted building on Fifth Avenue for the Solomon R. Guggenheim Museum, one of the city's few and rare really important and iconic postwar landmarks of modern architecture. With it entrance bridge and canopy over a walled, sunken plaza the building is a hulking and looming eminence grise on Madison Avenue. Far more monumental in appearance than its actual size and scale, it gray facades are punctuated by a few trapezoidal windows of different sizes and the building cantilevers forward towards the avenue. It makes no contextual gestures. It is a very bold statement that happens to have excellent interiors for a museum with high ceilings and large movable partitions, tall elevators and a surprisingly luscious and warm stone staircase with windows on the avenue. Although originally conceived to be a museum that covered the full breadth of American art, it increasingly over the years focused on more modern periods and became world-famous for its biennial exhibitions of contemporary art. It eventually began buying neighboring brownstones on the block for possible future expansion. Although the Landmarks Preservation Commission maintained that one of them was of "historical" merit, basically all of them were in poor condition and not very important. In 1978, when it was clear that the museum should be considering expansion and when it was beginning to open "satellite" museums in Lower Manhattan and midtown, Norman Foster designed a mixed-use tower that would provide museum expansion and for-sale apartments in a tower of about 30 stories on the south side of the avenue block. It had a slanted glass base and its tower was to be faced with interchangeable, black-metal panels with different geometric cut-outs. The top of the tower was supposed to be a glass-enclosed, multi-faceted "jewel" crown. It was a sensational design, perhaps Foster's best and one of the greatest modern towers ever planned. Sadly, the museum was not interested. Not long thereafter, however, the museum turned to Michael Graves, the country's leading "Post Modern" architect" best known for his very fine drawings and tea-kettle designs and later for large fanciful hotels at Disneyland in Florida, for its expansion plans. Graves's designs were not widely popular. 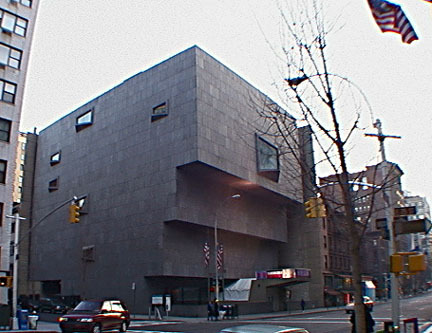 In his discussion of Michael Graves's controversial proposals, shown above, to expand the Marcel Breuer building of the Whitney Museum of American Art on Madison Avenue in New York, Paul Spencer Byard wrote in his superb book "The Architecture of Additions Design and Regulation" (W. W. Norton & Company, 1999, see The City Review article), that Graves's "start was promising." "Taking off from the original's essential Bauhaus objectness, he made a point of it, combining the original with more objects, ending its isolation and making it participate, however, reluctantly, with new mates. As in much of Graves's work, there was a question of scale; it was hard to know how big anything was supposed to be. In drawings his buildings often seem comically small, like piles of colorful toys. The Whitney too was made to seem like a toy, a gray grumpy, reluctant old boy at the bottom of a jolly game of colorful new lumps, a game that it might have set in motion but no longer controlled. Subject to regulation in the historic district, Graves's proposal was denounced as big and aggressive and progressively reduced in size, complexity and character...The proposal got drabber and drabber and the components less objectlike, which allowed Breuer, to a degree, to resume command as the principal object in a combined work of ever-decreasing interest....Reaction to the abandonment of the project depended in part on the degree of affection for the original; if Breuer's Whitney always seemed rather pompous, one might not have minded seeing it in a combination in which it had to work a bit, which prodded it to cheer up. But taking the Whitney with all the high seriousness with which it was originally offfered, and accepting its significance as one of the principal and most public built representatives of the ideas of its school, the new composition at its freshest did much to demean, not celebrate it. Even as the addition was dumbed down, Breuer never quite got out from under the impact of what would have been an unworthy new group of neighboring forms." The Breuer building is one of New York's few great modern buildings and Byard's analysis of Graves's schemes is very fine. More than a decade after the abandonment of the last of the Graves's schemes, the museum turned to Rem Koolhaas and he came up with one of his typically wild, adventurous, avant-garde and unexpected designs. It kept the facades of the low-rise buildings adjacent to the museum on the avenue and built a mid-rise building behind their facades that cantilevered partially over the Breuer building. Aesthetically, it wasn't pretty but its gray color and bold massing worked pretty effectively with the Breuer building. It was very contextual with the Breuer building, but it was pretty startling, if not terrifying, to the good preservation ladies of the Upper East Side historic districts. Koolhaas's design never gained much traction even though it was scaled back from 11 to 9 stories and in 2004 the museum turned to Renzo Piano, who recently did the expansion for The Morgan Library two miles south on Madison Avenue. The design by Koolhaas ratcheted up the architectural gambit in New York: its was a battleship roaring into the tepid architectural waters of the city with all guns booming - a thoroughly original, daring design that incredibly managed to try to throw a motherly, protective arm about the wound-up spring of Breuer's original masterpiece. Piano's design was safe and very conservative. In a June 16, 2004 article in The Times, Carol Vogel said that the museum had selected Mr. Piano and that his plan "is far more modest in size and scale than the ambitious $200 million proposal of the Rotterdam architect Rem Koolhaas, which the board abandoned last year, saying it would have been too expensive both to build and to operate." "'We knew we needed to hire an architect who could get a museum building built,' said Melva Bucksbaum, who headed the selection committee. 'We didn't feel we needed a destination building that would compete with the Breuer building. The Whitney already is a destination. Renzo saw the limitations and was interested in using them, not fighting them,'" the article said, adding that in an interview Mr. Piano, who was involved in the design of the great Pompidou Center known as Beaubourg in Paris, said that while "it won't compete with the Breuer building, it will have character." Mr. Renzo's popularity in New York was substantial as he designed a new headquarters building for The New York Times on Eighth Avenue at 41st Street (see The City Review article) and a major renovation at the Jacob Javits Convention Center. The latter plan was not carried out. In an article in The Art Newspaper, Jason Edward Kaufman wrote that in January 2004, "the trustees hired architecture consultant Reed Kroloff (now dean of Tulane University School of Architecture) to help compile a list of around 50 architects. An architecture selection committee chaired by trustee Melva Bucksbaum narrowed the field to a shortlist of 12 and interviewed the candidates in March and April. They included Herzog &amp; De Meuron, David Chipperfield, Todd Williams Billie Tsien &amp; Associates, Mr Gluckman, and a number of younger firms. But the board opted for Mr Piano, a Pritzker Prize winner who is currently the architect of choice for American museums. The Whitney board was so sure of their choice that when Piano refused to participate in a competition, they cancelled it and handed him the job anyway." "They were looking for function, not flash, Mr Weinberg explains, " the article said, noting that '“First and foremost is not the spectacle of the museum, but the spectacle of the art.' Artist Chuck Close, another trustee who served on the architecture selection, strongly supports the choice, noting that 'Renzo Piano creates spaces that allow works of art to live and breathe.'... 'I love the Breuer building,' Mr Piano says. 'It has a very strong presence, and the new one won’t be in competition with it,' he says." "The Whitney Museum of American Art's on-again, off-again expansion plan," Nicolai Ouroussoff wrote in a November 11, 2004 article in The New York Times, "has been lurching along for more than two decades now. In that time, the museum has gone through four directors and flirted with ill-fated designs ranging from the bold to the grotesque. The worst, a 1985 proposal by Michael Graves, would have smothered the existing building in a pastiche of pseudoclassical references. A more promising proposal by the Dutch architect Rem Koolhaas was dropped a year and a half ago amid post-9/11 uncertainty and a growing sense that the design was inappropriately aggressive. To many, it seemed as if the museum had simply lost its nerve." "Now," the article continued, "the Whitney is trying a gentler approach. A new design by the Italian architect Renzo Piano, approved last week by the museum's board, is conceived as a stoical nine-story tower that would rise alongside the existing 1966 landmark. The tower's simple form and silvery copper-and-aluminum-alloy skin would be a dignified counterpoint to Marcel Breuer's brutal dark granite masterpiece. Respectful of its context, the proposal is about incremental progress, not radical change. The design, which would double the size of the museum, is still in its earliest stages; the Whitney plans to present a refined version to the city's Landmarks Preservation Commission in January. The aim clearly is to placate the preservationists and community leaders who have stymied the Whitney's expansion plans in the past. Such humility may seem laudable. Who doesn't want to preserve the city's architectural legacy? But great design is never cautious; it cannot arise amid a climate of fear. The risk is that the building will ultimately be too subdued, as if it is trying too hard to fit in. If the city is to get the full benefit of Mr. Piano's talent, the Whitney will have to grant him the freedom to follow his ideas, wherever they lead." "The design starts confidently enoug," the article maintained, adding that "Breuer's Whitney, with its inverted ziggurat-shaped facade and moatlike sculpture garden, is a portrait of monastic seclusion. Mr. 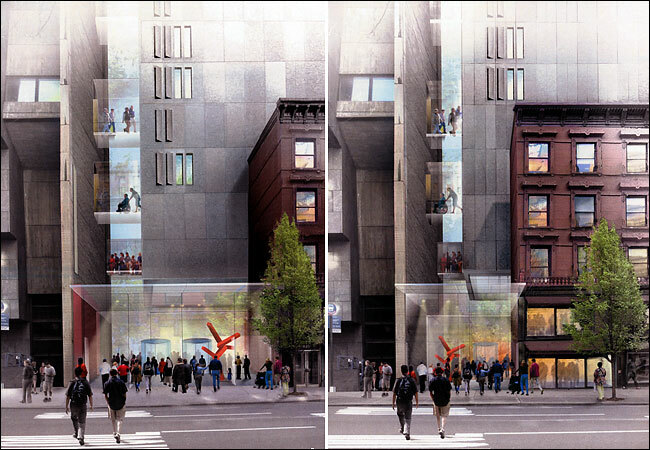 Piano seeks to open the museum up to the surrounding street life by demolishing two town houses just to the south on Madison Avenue and replacing them with a glass-covered entry vestibule and a small garden. From here visitors will slip under the cantilevered corner of the new building before turning into a new lobby and cafe area. The addition rises above this space behind the remaining brownstones on Madison. Mr. Piano, whose New York projects also include additions to the Pierpont Morgan Library and a new headquarters for The New York Times, has always brought a remarkable sense of clarity to his work. The son of a Genovese builder, he is a master of structural detail, which in his hands typically has a clean modern sensibility....The biggest problems, however, arise when you sense that Mr. Piano is deferring to Breuer - for example, with the aluminum-and-copper-alloy panels that would clad the addition. Mr. Piano compares the panels' silvery overlapping forms to textured fish scales that are meant to play off the smooth, polished granite panels of Breuer's façade. But the contrast doesn't feel strong enough. Because the panels are roughly of the same size and proportions as Breuer's, they risk making the addition look like a towering shingle-style barn. Another issue is how you enter the museum. In creating his new entry point, Mr. Piano has made Breuer's existing entry bridge over the Whitney's sculpture court somewhat redundant. In truth, the bridge has never worked. Its heavy concrete form casts a dark shadow across the court below, making it an oppressive place to view sculpture; its concrete canopy blocks the view from the bridge to the main facade so that you never feel the full force of its weight. Mr. Piano has toyed with the idea of tearing out the bridge and replacing it with a narrower lightweight structure. The solution - an obvious one - would help shift the focus to the new entry and open up the glorious view to Breuer's facade. It would also go a long way in tying the two buildings together into a cohesive composition. But so far the museum's board has refused to even discuss the idea for fear of incurring the wrath of preservationists....Breuer's building is no shrinking flower. The building's aggressive forms capture the museum's ethos as a place for creative expression - it acknowledges that most new ideas are by nature impolite. In its time, it was also a slap, conscious or not, against the confining traditions of polite Upper East Side society. It was that sense of irreverence that Mr. Koolhaas sought to tap into. His design - a bold composition of faceted concrete forms that loomed over the Whitney as if it were about to devour it - was brash, playful and bizarre. It was too much for the Whitney to swallow. Mr. Piano is more cautious by nature, but his work, at its best, has a wonderfully human quality. To stand up to Breuer, he will have to show a bit more bravado. He should respect the past, but he should challenge it, too." In an article about "The Whitney's Identity Crisis" in the November 2, 2006 edition of The New York Times, Nicolai Ouroussoff asked "When will the Whitney learn its lesson?" adding that "Over the last two decades the museum has trotted out architectural proposals by Michael Graves, Rem Koolhaas and Renzo Piano for an expansion of its site on Madison Avenue at 75th Street. The designs have ranged wildly, from kitschy to audacious. All have been dumped with little ceremony, the victims of a hostile neighborhood and a fickle board of trustees. But only now has the process turned truly comical. 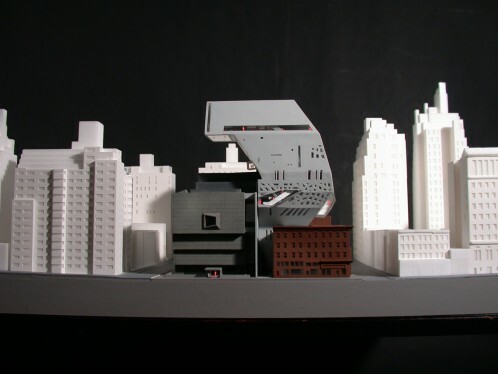 The recent admission by the Whitney Museum of American Art that it is considering the addition of a downtown branch instead of proceeding with its on-site expansion effectively sounds the death knell for Mr. Piano’s project just three months after the addition won final approval from the city’s Board of Standards and Appeals. After years of stop-and-go plans and public soul searching, the museum is evidently still seeking an identity. As strange as it seems, the museum may be better off giving up on the Piano expansion. The Whitney has been worn down by battles with local preservationists, who never wanted any kind of addition on Madison Avenue anyway. A new site with bigger floor plates could give the curators more flexibility for exhibitions. And the city is offering the museum a choice location: a sprawling site in the meatpacking district at the foot of the High Line, an elevated public park that is one of the most intriguing urban projects in Manhattan today." "Still," the article continued, "the Whitney’s latest about-face points to an underlying malady. Architects are only as good as their clients. They can give conceptual form to an institution’s identity, but they can’t invent it. The Whitney’s endless false starts are a symptom of self-doubt and internal confusion. Unless its board, led by Leonard A. Lauder, is able to muster some courage and conviction, a sudden change in site is not going to fix the problem. The Whitney’s argument is simple enough. Adam Weinberg, the museum’s director, says the price tag for the Piano addition, estimated at $200 million-plus, is too high for a building that will only add another 30,000 square feet of gallery space. (The museum’s current 1966 Marcel Breuer building has 32,000 square feet of galleries.) He contends that stacking the galleries on seven floors, with relatively small floor plates, is too confining. At a new site, he hopes, the museum could carve out larger, wide-open galleries on fewer floors. But this could hardly be an epiphany. That the galleries in a Madison Avenue addition would have to be stacked in a vertical composition was as true five years ago, when the museum hired Mr. Koolhaas to develop his proposal, as it is today. And the estimated cost for both was virtually the same - $200 million or so - and both designs provided the same 30,000 square feet of new gallery space. 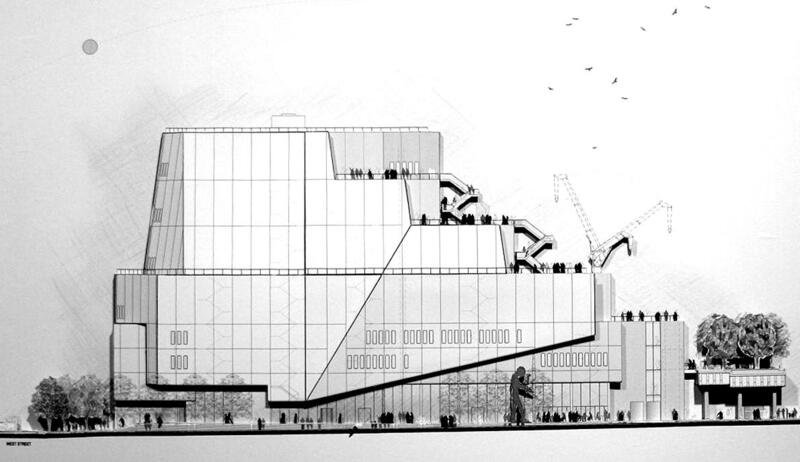 Through its indecision, the Whitney has squandered a lot of time and money. Maxwell Anderson, the Whitney’s previous director, said the museum spent nearly $6 million in architectural, engineering and legal fees to develop the Koolhaas design. One can safely assume that it has spent far more on its collaboration with Mr. Piano (who is to be retained for whatever project it pursues, the museum says). " "The strangest thing about the Whitney’s various approaches," Mr. Ouroussoff wrote, "is that they express radically different architectural and curatorial points of view. Mr. Koolhaas’s addition would have been one of the boldest pieces of architecture to emerge in years, while offering a powerful lesson in how to deal responsibly with historical context. By accepting existing landmark constraints, including the preservation of a row of brownstones along Madison Avenue, Mr. Koolhaas seemed to imply that past, present and future need not be in violent opposition to one another. Rising in aggressive contortions behind the brownstones, his design seemed to shelter the old granite Breuer building even as it loomed over it like a gigantic cat’s paw. Equally important, he used the design to meld a strong curatorial vision. The bulk of the museum’s prewar collections would have been displayed in the late-19th-century brownstones, bigger postwar art in the Breuer building, and contemporary art in a new tower." In April, 2003, when the Whitney announced it was scraping the Koolhaus plan, Maxwell Anderson's, the museum's director at the time, said "we're feeling the pinch," adding "a project like this would be a big challenge, and we're not in a position to proceed with it." In an April 15, 2003 article in The Times, Carol Vogel noted that "this is not the first time the Whitney has abandoned expansion plans. In 1985, in the face of an uproar from neighbors, architects and civic groups, the museum gave up plans to build a $37.5 million 134,000-square-foot addition that was to have been designed by the Princeton architect Michael Graves. 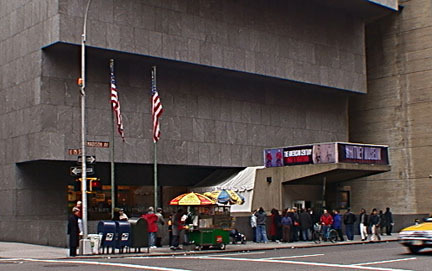 Mr. Graves's postmodern design would have radically altered the facade of the Breuer building. Since then, the Whitney has proceeded gingerly. Five years ago it expanded from within, providing 30 percent more exhibition space by moving its library, archives and offices from the fifth floor of the Breuer building to an adjoining brownstone at 31-33 East 74th Street. In a March 16, 2005 article in The New York Times, Robin Pogrebin wrote that at the Landmarks Preservation Commision public hearing on the Piano expansion plan some commissioners said it should be altered to preserve the brownstone buildings and "visibly agitated, Mr. Piano countered that retaining the brownstones would undermine the essential notion of his design, which is to open the Whitney to the street and invite people into the piazza. 'I'm a bit at a loss,' he said. 'How can you make a piazza - create a sense of connection - if you have to enter through a shop window?' 'It's not going to work,' he said. 'You need somebody who will invent something else, because I don't see how to solve the problem.' Mr. Piano also argued that retaining the brownstones would disrupt the balance between the Breuer building, the brownstones and his new nine-story addition, making the new tower essentially 'disappear.'" In a May 25, 2005 article in The Times, Ms. Pogrebin wrote that "The New York City Landmarks Preservation Commission voted yesterday to approve a modified expansion plan for the Whitney Museum of American Art that would prevent the razing of one Madison Avenue brownstone. The vote, which was unanimous, was a mixed victory of sorts for the architect, Renzo Piano. After heated arguments from preservationists in previous hearings, he submitted an alternative plan halving the size of a proposed new entrance for the museum so he could spare the brownstone and win the commission's approval." 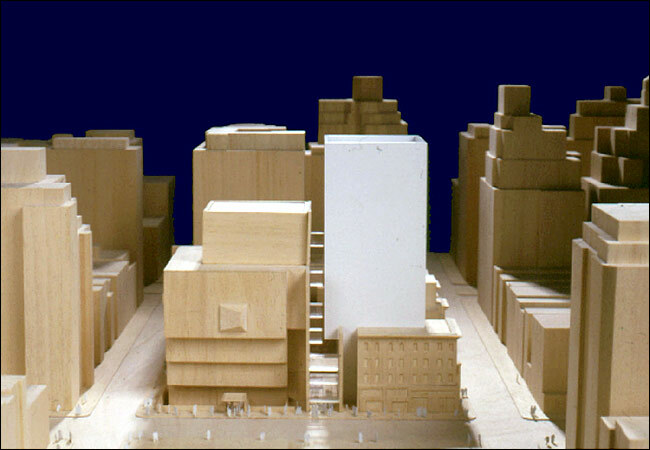 On January 11, 2006, the land-use committee of Community Board 8 voted 25 to 11 to approve plans by the Whitney Museum of American Art to ask for seven zoning variances from the city’s Board of Standards and Appeals for a major expansion of the museum. The design approved by the landmarks commission cannot be built within existing zoning regulations relating to street wall, setbacks, height, and rear yards. Howard Zipser, a land-use attorney who is a member of the Coalition of Concerned Whitney Neighbors, told the meeting last night that it was highly unusual for any project to seek 7 variances and that several of them could be resolved by reducing the bulk of the planned expansion. Elizabeth Ashby, a member of the community board and co-chairman of the Defenders of the Historic East Side, proposed a resolution that would deny the variances unless the new building was no taller than the existing Breuer building, arguing that the variances effectively waive “all the features of the Special Madison Avenue District zoning.” The Breuer building is 97 feet high 8 inches high on the avenue and the proposed addition setback from the avenue is 178 feet high. Her resolution was defeated by a vote of 24 to 12. The museum’s plan uses “little more than half of what is permitted” under existing zoning regulations. On July 25, 2006, the board approved the seven variances. 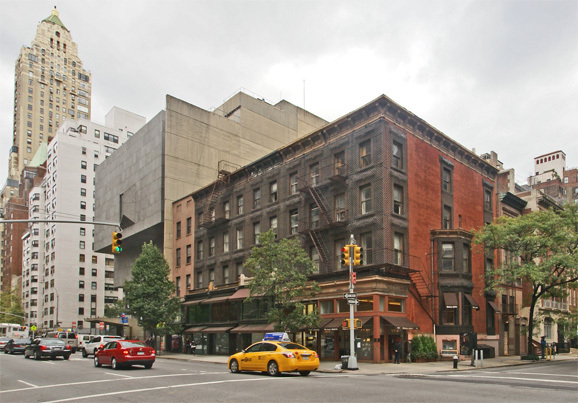 A September 1, 2006 article in The New York Sun by Kate Taylor said that two association of residents in the museum's neighborhood and the owners of the nearby Carlyle Hotel filed suit against the city hoping the overturn the variances and force the museum to scale back its plan. "'They granted seven variances; it's almost as if they rewrote the zoning law just to fit the Whitney,' a member of the Coalition of Concerned Whitney Neighbors, a party to the lawsuit, Edward Klimerman, said. In interviews, individuals involved in the suit were most vociferous in their objections to the height and appearance of Mr. 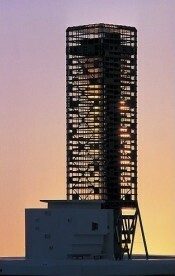 Piano's tower. 'This is an 18-story filing cabinet, a metal building with basically no windows whatsoever, standing amid beautiful townhouses,' the president of the Coalition of Concerned Whitney Neighbors, Donald Gringer, said. 'A steel-paneled building really belongs in an industrial park,' he added. 'I wouldn't up a building like that in the Bronx,' where he owns a factory. 'He's putting it up in a beautiful landmarked district,'" the article continued. Then, on October 31, 2006, Ms. Pogrebin wrote an article in The Times that said that the museum, "after fighting for more than a year to have an addition to its Madison Avenue building approved, has all but decided that moving its expansion to another site would make more sense, people involved in the process say." "The museum," the article said, "won its struggle to have the city approve a tower designed by the architect Renzo Piano. But after weighing the pros and cons, those familiar with the process say, the Whitney has determined that the Piano project may not get the museum sufficient additional space for the money. The museum has instead set its sights on a location downtown at the entrance to the High Line, an abandoned elevated railway that is to become a landscaped esplanade. The Dia Art Foundation announced last week that it no longer planned to build a museum there. This marks a striking turn of events for the Whitney, since the museum has tried for 20 years to add onto its 1966 Marcel Breuer building. In July the museum finally completed the public approvals process and was allowed to go forward." "Building at the downtown site would allow the Whitney to keep operating at its uptown location throughout the construction. To build the Piano addition, it would have been forced to close for two years, losing its presence at precisely the time that the New Museum of Contemporary Art was reopening in its new building on the Bowery," the article said. On November 2, 2006, architecture critic Nicolai Ouroussoff of The New York Times wrote an article about the museum's "identity crisis." "When will the Whitney learn its lesson? Over the last two decades the museum has trotted out architectural proposals by Michael Graves, Rem Koolhaas and Renzo Piano for an expansion of its site on Madison Avenue at 75th Street. The designs have ranged wildly, from kitschy to audacious. All have been dumped with little ceremony, the victims of a hostile neighborhood and a fickle board of trustees. But only now has the process turned truly comical. The recent admission by the Whitney Museum of American Art that it is considering the addition of a downtown branch instead of proceeding with its on-site expansion effectively sounds the death knell for Mr. Piano’s project just three months after the addition won final approval from the city’s Board of Standards and Appeals. After years of stop-and-go plans and public soul searching, the museum is evidently still seeking an identity." "As strange as it seems," the article continued, "the museum may be better off giving up on the Piano expansion. The Whitney has been worn down by battles with local preservationists, who never wanted any kind of addition on Madison Avenue anyway. A new site with bigger floor plates could give the curators more flexibility for exhibitions. And the city is offering the museum a choice location: a sprawling site in the meatpacking district at the foot of the High Line, an elevated public park that is one of the most intriguing urban projects in Manhattan today. Still, the Whitney’s latest about-face points to an underlying malady. Architects are only as good as their clients. They can give conceptual form to an institution’s identity, but they can’t invent it. The Whitney’s endless false starts are a symptom of self-doubt and internal confusion. Unless its board, led by Leonard A. Lauder, is able to muster some courage and conviction, a sudden change in site is not going to fix the problem. The Whitney’s argument is simple enough. Adam Weinberg, the museum’s director, says the price tag for the Piano addition, estimated at $200 million-plus, is too high for a building that will only add another 30,000 square feet of gallery space. (The museum’s current 1966 Marcel Breuer building has 32,000 square feet of galleries.) He contends that stacking the galleries on seven floors, with relatively small floor plates, is too confining. At a new site, he hopes, the museum could carve out larger, wide-open galleries on fewer floors." "Through its indecision," Mr. Ouroussoff wrote, "the Whitney has squandered a lot of time and money. Maxwell Anderson, the Whitney’s previous director, said the museum spent nearly $6 million in architectural, engineering and legal fees to develop the Koolhaas design. One can safely assume that it has spent far more on its collaboration with Mr. Piano (who is to be retained for whatever project it pursues, the museum says). The strangest thing about the Whitney’s various approaches is that they express radically different architectural and curatorial points of view. Mr. Koolhaas’s addition would have been one of the boldest pieces of architecture to emerge in years, while offering a powerful lesson in how to deal responsibly with historical context. By accepting existing landmark constraints, including the preservation of a row of brownstones along Madison Avenue, Mr. Koolhaas seemed to imply that past, present and future need not be in violent opposition to one another. Rising in aggressive contortions behind the brownstones, his design seemed to shelter the old granite Breuer building even as it loomed over it like a gigantic cat’s paw. Equally important, he used the design to meld a strong curatorial vision. The bulk of the museum’s prewar collections would have been displayed in the late-19th-century brownstones, bigger postwar art in the Breuer building, and contemporary art in a new tower." "Unlike Mr. Koolhaas," Mr. Ouroussoff wrote, "Mr. Piano is not the kind of architect who will impose a strong vision on a timid board. And his design, which never quite attained the same level of imaginative power, could in some ways could be said to reflect the compromised nature of the institution. In their desire to appease local preservation advocates, museum trustees asked Mr. Piano to make some unwanted compromises, like suggesting he retain a brownstone he hoped to demolish to make way for a more generous public entrance. Most of Mr. Piano’s galleries were big generic boxes stacked one atop the next, more a reflection of the Whitney’s wishy-washy thinking than a clearly articulated position on how to display contemporary art." In a November 28, 2006 article in The New York Times, Carol Vogel wrote that "A month after the Dia Art Foundation scrapped its plans to open a museum at the entrance to the High Line, the abandoned elevated railway line that the city is transforming into a public park, the Whitney Museum of American Art has signed on to take its place and build a satellite institution of its own downtown." "The Whitney recently reached a conditional agreement on Wednesday night with the city’s Economic Development Corporation to buy the city-owned site, at Washington and West Streets in the meatpacking district, officials at the museum said yesterday. Plans call for the new museum to be at least twice the size of the Whitney’s home on Madison Avenue at 75th Street, they said, and to be finished within the next five years. Mr. Piano has agreed to design the new museum. Although no architectural plans have been drawn up, the future museum is loosely estimated to afford at least 200,000 square feet. In addition to a second site the Whitney is also planning to upgrade the Breuer building significantly, with improvements like new, double-glazed windows and a better climate control system, Mr. Lauder said. 'The Breuer building is now 40 years old, and a lot of technology has happened since it was built,' Mr. Lauder said. 'It is our iconic building, and we are planning to put a lot of money into it.' While he said it was too early to say just how much 'a lot' is, he estimated the cost of refurbishing the building at $20 million to $40 million. While taking note of the creation of dual-site museums like the Tate in London and the Museum of Contemporary Art in Los Angeles, Mr. Weinberg said the Whitney was hoping to invent a model of its own. 'We are envisioning both sites will show contemporary and historic art,' he said." In a May 1, 2008 article in The New York Times, Nicolai Ouroussoff wrote that "Optimism is in the air again at the Whitney Museum of American Art, which has just released a preliminary design by the Italian architect Renzo Piano for its proposed satellite museum downtown," adding that "With its decision to build a second museum in the meatpacking district, the Whitney seems to have found its bearings." "Mr. Piano’s project for a site on Gansevoort Street, west of Washington Street, is a striking departure from the ethereal glass creations that have made him a favorite of the art-world cognoscenti. Its bold chiseled form won’t appeal to those who prefer architecture to be unobtrusive....Mr. Piano’s design is certainly distinct from Breuer’s, presenting a strange, even forbidding aura. The building’s faceted surface seems hewed from a massive block of stone. Its main facade is slightly angled to make room for a small public plaza. The roof steps down in a series of big terraces on one side; on the other, it forms an impenetrable block facing the West Side Highway. But as you study the form more intently, more layered meanings emerge. The stepped roof, for example, both supports a series of outdoor sculpture gardens and allows sunlight to spill down onto the High Line, the elevated rail bed that is being converted into a public garden. The angle of the facade allows people walking along the High Line to catch glimpses of the Hudson River down Gansevoort Street....The new museum will have 50,000 square feet of gallery space, compared with 32,000 uptown. The third-floor gallery, at 17,500 square feet, will be the largest column-free space for viewing art in Manhattan, Mr. Weinberg said." The Whitney Museum of American Art October 14, 2010 sold the six brownstones just to the south of its "signature Marcel Breuer building on Madison Avenue as well as two townhouses around the corner on 74th Street," according to an article by Carol Vogel in today's edition of The New York Times. "The transaction," the article continued, "makes it virtually impossible for the museum to expand in the neighborhood it has called home since 1966. 'This is a major step toward the realization of a long-sought-after new facility that will better serve our artists and the community,' said Adam D. Weinberg, the Whitney’s director." The museum is shifting its focus from the Upper East Side to the meatpacking district, the article said, adding that "Neither the museum nor the buyer would confirm the purchase price, although officials at the Whitney had said that they hoped to raise at least $100 million from the sale of the buildings. The money will go toward the Whitney’s endowment and the construction of a new six-story museum designed by Renzo Piano and to be built at the entrance to the High Line, the abandoned elevated railway line that has been transformed into a public park'"
"With the sale, Mr. Weinberg said, the Whitney has raised $475 million of its $680 million goal. The buildings’ buyer - JZS Madison LLC - is owned by Daniel E. Straus, who operates a family investment business, said Kathleen Cudahy, his spokeswoman. Mr. Straus plans commercial and residential uses for the property," the article said. The museum has had many plans to expand on Madison Avenue including three proposed by Michael Graves, then a plan by Rem Koolhaus and finally a plan by Renzo Piano. Mr. Piano is designing the meatpacking district location at the foot of the HighLine Park. Four of the brownstones date from the 1890s and the article said they are "considered architecturally important enough that their facades must remain intact" because they are in the Upper East Side Historic District. The article said that Ms. Cudahy said that “Mr. Straus is well aware of the public review process for this historic district,” and has "hired Beyer Blinder Belle, a Manhattan architecture firm that specializes in preservation, to advise him on the site’s possibilities." "The fate of the Breuer building is uncertain. The Whitney cannot simply sell it, as some people involved with the museum would like to do. When Leonard A. Lauder, the Whitney’s chairman emeritus and its largest benefactor, gave the museum $131 million in 2008 - the biggest donation in its history - the money came with the stipulation that the building could not be sold for the foreseeable future, although he declined to specify for how long. Realizing that it cannot afford to run two buildings, the Whitney is in discussions with the Metropolitan Museum of Art about a possible partnership. The arrangement would not take place until the Whitney’s new museum is completed in 2015, at which point the Met could embark on a much-needed renovation of its own galleries for modern and contemporary art, temporarily parking its collections at the Whitney," the article said. "What should a museum look like, a museum in Manhattan? Surely it should work, it should fulfill its requirements, bujt what is its relationship to the New York landscape? What does it express, what is its architectural message? "It is easier to say first what it should not look like. It should not look like a business or office building, nor should it look like a place of light entertainment. Its form and its material should have identity and weight in the neighborhood of fifty-story skyscrapers, of mile-long bridges, in the midst of a dynamic jungle of our colorful city. It should be an independent and self-relying unit, exposed to history, and at the same time it should have visual connection to the street, as it deems to the housing of twentieth-century art. It should transform the vitality of the street into the sincerity and profundity of art. "The conception of the project shows a sunken sculpture court between the sidewalk and the building - spanned over by the entrance bridge and it shows the Madison Avenue glass front of the lobby and sculpture gallery; contact with the passersby. While the inverted pyramid of the building mass calls attention to the museum and to its special dedication, the mass is surfaced with a most durable, retiring and serene material: a warm gray granite, rather dark. The structure, reaching out high over the sculpture yard, does not stop the daylight and the west sun, and receives the visitor before he actually enters the interior of the building. One sees the sunken yard and its sculptures from the sidewalk and the entrance bridge. Also one sees the lobby and the sculpture gallery through the glass walls. To emphasize the completeness of the architectural form, the granite facades on both streets are separated from the neighboring fronts: an attempt to solve the inherent problem of a corner building which otherwise could easily look like a quarter part of something. The project transforms the building into a unit, an element, a nucleus, and lends it a direction toward Madison Avenue. The overall granite facing, homogeneous, extending out and over toward Madison Avenue, reaching down into the sunken garden with openings that grow out of the surface, with the modulations of the Madison Avenue gap between it and the neighboring buildings, with the granite parapet along the sidewalk, and with the sculpture concrete form of the bridge - all this to form the building itself as a sculpture...."
In an April 13, 2010 article in The New York Times, Roberta Smith wrote that "The Whitney’s design for its downtown site is by Renzo Piano, whose track record for museums hasn’t been too great lately. His Broad building at the Los Angeles County Museum of Art is SoHo-Chelsea chic times three. His atrium at the Morgan Library and Museum, while beautiful as a space unto itself, is of the event variety; it has diminished, not improved, that museum’s gallery spaces and their layout. And then there is the Art Institute of Chicago, another event-oriented space where art is tucked away. It was definitely a relief to read in The New York Times on Monday, that Mr. Piano’s plans for angled walls at the Whitney’s proposed downtown building had to be eliminated to cut costs on his new design. Not to diminish the financial and logistical risks of a venture like this, but New York’s recent museum debacles have taught us that space can justify the means. The success of an undertaking like this hinges not on the size but on the quality of the space, which is never thought about enough and never by the people who really know what they’re doing where museums are concerned. The idea that trustees have the final word on a museum’s design, considering all the atrocious buildings that have been erected in this country, is chilling. When will they ever learn to listen, and to people who have the right experience? They would get better spaces if they would loosen the reins. A new downtown Whitney has to make art look good, make people feel good in it, inspire curators to do their best and give the place some kind of identity - a profile - the way Dia’s old building did. Which is to say that it doesn’t have to have tourist-attracting bells and whistles, as is the case with the Guggenheim (no disrespect intended). It just has to give people a breathtaking, vision-expanding experience of art. This is as much a matter of proportion, openness and light as square footage, as the old Dia proved repeatedly. Its spaces set a standard for display that seems to have been lost in Manhattan, and it was lost, again, because of trustee arrogance and administrative mismanagement that put too many of the Dia’s eggs in its Beacon, N.Y., basket." A New York Times article by Carol Vogel after the sale of the brownstones wrote that their sale "will effectively end any chance of the Whitney expanding in its current space, where it has been since 1966 and which it has been trying to enlarge since the architect Michael Graves unveiled the first of many expansion plans in 1985. Without room to grow uptown, and without the income necessary to run two museums, the Whitney now faces the question of what to do with the Breuer building - which may end up being shared, at least temporarily, by another institution, perhaps the Metropolitan Museum of Art. The board met not at the museum, as it usually does, but in a conference room at the Standard Hotel on Washington Street, a block and a half from the new site. During the two-hour meeting, Leonard A. Lauder - the Whitney’s chairman emeritus and largest benefactor, and until now an opponent of the project - surprised everyone by voting in favor of the new building. Indeed, although there have been rumors for weeks that Mr. Lauder was considering resigning if the project went ahead, he spoke passionately in favor of it at the meeting....In 2008, when he gave the institution $131 million - the biggest donation in its history - the gift came with the stipulation that the building could not be sold for the foreseeable future. And that summer, concerned about the financial pressure that maintaining both the uptown museum and a possible downtown one would put on the Whitney, he met for lunch with Philippe de Montebello, then the Met’s director, and broached the subject of a possible partnership. Thomas P. Campbell, Mr. de Montebello’s successor, took up the discussion after he became director." The new downtown plan is an improvement over Piano's Madison Avenue expansion scheme but it is worrisome that the Whitney might abandon Breuer's building. It operated satellites for many years and the Guggenheim still does so there is no reason that it cannot use both facilities. It shouldn't throw the baby out with the bath water!